I want to wish all of my readers a Happy Safe and Creative 2009! Thank you for reading my blog ,leaving your comments and thoughts and just being my friends! Thank you for your support of my books and cd's and my fabric and even the occasional quilt purchase. I am afraid 2008 has ended with another sting in the tail- the new old car that I bought as back up is having starter motor problems. So here is hoping it will get to town so I can get it fixed. I have had several people email me and ask whether 72 More Ways book was a second edition of my first book 72 Ways. It isn't - it is an entirely new book with entirely new ideas for machine quilting/stitching. I have been stitching and stitching on my tears/lozenge piece as I was determined to finish it before the new year started so I can start on something fresh for 2009.It's all done now and it's for sale if anyone is interested .It measures 18 inches by 12 inches ( 45 cm by 30 cm) and is entirely stiched by hand. Close to Damascus many villages dot the hilly landscape, the minartes towering above the villages. Last night I sat and played with a photo I had taken in Venice on my recent travels which I had printed onto water colour paper. The image cried out for something more and as I have been struggling with doing anything creative I decided I would “decorate” the photo. Now the word “decorate” is a loaded word, but has been playing in my mind since we have moved and as I am decorating my environment to reflect my interests and things I have collected over the past. The other thought that played in my mind is why hundreds of thousands of people flock to Venice every year- it is a special place, but what makes it so special? Is it the canals, the narrow streets, the lack of cars, the lack of the “modern”? It is, if anything, a highly decorative city- as you walk around it you are charmed by ornately carved balconies, iron filigree, arched doorways- in fact much of Venice is “decorated”. Part of what has been lacking in my process to work, is to let my mind wander around what it is I am creating- my mind has been elsewhere (preoccupied with personal things) and so I made a decision. I would track the way I normally do when I am not preoccupied, which is to research and read and ponder the ideas I want to explore, and let that inform any work I may create. Keeping a journal is part of this process- and I seem to have not done anything journal wise- or hardly anything since about May of this year. So step 1 is to resurrect my journal- doesn’t matter what, and then define key words. So then I looked at each of the individual artists represented in the catalogue and found that few had any web presence and even fewer had images of their work as a body of work- a great pity. I am so used to being able to find so much on the net- and it is not about appropriation, it is about research- looking at how each of the artists has investigated their response to the idea of working with pattern and decoration. Ibn Battuta was a famous 13 th century traveller who travelled through the region before Marco Polo and recorded his adventures int eh written form. I like to think of this blanket as a cloth version of such memories- each fragment containing a memory of travels in a time when people did not have journals or pens. This quilt is inspired by the eye idols found at the archeological dig at TelBrak- hundreds were found in the temple area, but no one knos what they were used for. Each one is different and so it si thought they may represent individual worshippers. This pomegranate tree created in the tifaifai method is inspired by a roman mosaic I saw at the Museum in Alleppo. This is the positive interpretation. Hand dyed silk , machine stitched. I have been working away at the tears piece- 13 tears for 13 years- only one more tear to go. I don't seem to be able to set my mind to anything else much at the moment. Have taken up my journal again after a hiatus- just anything to get going again! However as I have been working I am starting to think these aren't tears any more but more like Christmas baubles- there is even a Christmas tree which wasn't intentional at all, but just happened. I think it is telling me something! So on that note , however you celebrate this time of year, whatever your beliefs, I wish one and all the best of times and let's hope that the world in 2009 will be a different better place for all of us who inhabit it- let each of us acquire a new green habit, no matter how little, it will all help. My intent is to make sure I use those green bags when I go shopping instead of forgetting them in the laundry! In my various travels in the Middle East I have bought textile inspired things or been given them. The wall hanging is from the tentmakers in Cairo Egypt, and I liked this particular man's work because of the embroidery touches on the birds- none of the other tent makers seemed to do this. I have also bought various boxes- some in Syria and some cedar ones in Morocco many years ago- and the little cross stitch blocks were a gift from one of my students from Oman where she had bought them in the market place. So this is my little middle eastern inspired corner. I have been thinking about the good things that have happened in this last year, it has been all too easy to get lost in the bad things, and also thinking about plans for the next couple of years. We have found a house to live in- which suits us better than our last one. It is possible to have a vegie patch here- yay! 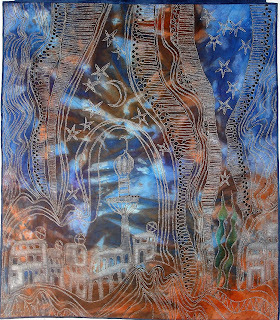 I was invited to exhibit my Carvanserai exhibition at AQC in Melbourne in late Feb. I wrote Seventy Two MORE Ways not to Stipple or Meander. The art exhibit will feature hundreds of fiber cards from over twenty-six countries and 46 states.The work of nineteen internationally known fiber artists will also be on display. 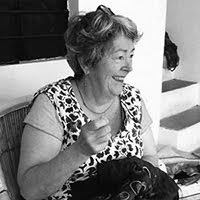 These invited artists include:Dijanne Cevaal, Sharon Boggon, Dale Rollerson, and Doreen Grey and her granddaughter Ebony of Australia; Beate Knappe and Wanda Lenz of Germany; Emmy Schoonbeek and Jacqueline de Jong of the Netherlands; Arlee Barr of Canada; Lynda Monk and Maggie Grey of Great Britain; Annica Lindsten of Sweden; Nikki Wheeler of Washington; Veleta Staffney and Corinne Stubson of Oregon; Penny Sisto of Indiana; Jill Rumoshosky Werner of Kansas; and Susan Sorrell and Susan Lenz of South Carolina. We spent a substantial part of yesterday clearing away the long long grass on my block and cleaning up branches and bits of wood that were lying around everywhere. We have still more clearing to do, but I want to sell the block. So photo one shows the view towards the back fo the block, photo two from around the middle of the block beside my shed/studio. The block is an acre and a quarter with town water and electricity paid for ( when I can find the letter) There are established fruit trees, mostly varieties of apple, a hazelnut grove, a dam and some olive trees plus reisling grape vines. I am anxious to put it on the market as another block of the same size sold last week for a substantial price- and we get an influx of visitors over summer. There is not much residential land availabel in the Otways as most land has conservation zoning. And of course it has a lined shed with wood heater! So here is hoping it will sell. Then this morning we hopped in the car- turned the key - and apart from the fact the starter motor was working- nothing. Argghhh My little Nissan needs a lot of work done to it, cv joints creak loudly, clutch is very short and then this- it seems it is the fuel pump! Just what you need before Christmas when you live 22 kms out of town. Fortunately I had bought a friends car last week ( and it needs some work done also, the muffler is loud loud loud) as a back-up car and to eventually give to my eldest daughter when she turns 18- so thank goodness for that.But it needed a new battery before we could get it going as it had been sitting for about 8 weeks. So the long and the short of it is - we got very little textile done these last two days. Hope my block sells! The printed lozenge/tear drop shape was from quite a number of years ago , for a quilt I made that got into Quilt 2001. I had created a gocco screen ( similar to thermofax) and printed the bright orange fabric. I found some left over ones the other day and of course reminded myself that I love that tear drop/lozenge shape and have played around with ideas for it for quite some time. I liked what happened when i put the butter yellow french knots onto the black dots in the design. I must find the screen i made for this as I want to make some more of these- I like how textural it feels under my hand. I feel like I am finding myself again. I just don't see how you make any kind of money at $35 for a beautiful piece of work- unless you are a machine able to crank them out a dozen/hour! Amazing. Thank you Miles for that comment! I find it difficult to price things. As I have always supported my family from my art/teaching and writing I need to keep things turning over and I would like to put bigger prices on things- on the other hand my price is based on an hourly rate. And because I am now a single parent in rented accommodation I am very mindful and perhaps even a little anxious that I need to keep things ticking along, otherwise I will need to partially abandon what I am doing and go back to regular employment whilst I work out what to do with my piece of land and whether I can make, living in France, in 2010 a reality for at least a year. I would love to hear some views as to how other artists price things. It sometimes feels as if you need to reinvent the wheel each time. Thoughts anyone? Finally did some machine sewing today after I found a whole pile of pomegranates which I had previously printed and cut out.It really is a bit of a nightmare having things everywhere, but I almost feel as if setting it all up properly would be not working- but in the long run a bit of organisation wouldn't hurt. These pomegranates measure approximately 8 inches square and are for sale for $35 US inclusive of postage. Someone asked what a Wonga was- well it's just a day at my house and given its called Wonga Flats I thought I would call the day a Wonga day- play days really. I decided early on that I would do all things french today- music movies, food and that I would work on a small piece in tear drop shapes. The reason for chosing a shape to work with was inspired by Jude Hill from Spirit Cloth and her post about working with dots or circles. I have to admit being inordinately fond of dots or circles myself and was very tempted to work with dots also but then a thought struck me, if I am going at this with full intent why not try and work away some of my tears and grief of the last two years before the new year, so that I can start fresh. So with that in mind I decided to use the tear drop shape- of course anything to do with the subject of mother/ daughter has to have a pomegranate in it and the little face was one I drew the day after my daughter left home all that time ago. I was expecting this to be a tearful exercise but instead find myself strangely calm and even hopeful- as if the physical act of actually acknowledging what is gnawing away at me is releasing some of the negative energy. In the all things French category I watched Amelie, what a delightful movie that is, and then Les Choristes ( if you have a penchant for choir music this is a wonderful uplifiting story of a teacher who shares his music with boys in a boys home/school for misfits and creates a choir) and then Manon des Sources the story of Jean De Florette's daughters' revenge for the death of her father- and what revenge it is , and then the final bitter twist at the end. Magnifique! Lunch was a french salad with home made french dressing ( I hate hate hate bottled dressings , and must admit to being really annoyed when a restaurant or cafe serves bottled dressing- it's so easy to make a good dressing and changes the salad) and feta ( I know not quite french but...) and lardons( well not quite as you can't get the nice bacon you get in France, here) .Oh and for the music I have been listening to Renan Luce- I like that I can understand a lot of the words. The link I have given is to a Youtube video of Les Voisines and if you are a Hitchcock fan you will enjoy this take on a Jimmy Stewart classic! And last but not least , I found this little Japanese prayer book amongst my stuff the other day- it dates from the edo era I believe and is a Bhuddist prayer book- the pages are all hand written ( and they made many of these prayer books) with little red dots here and there marked by the monk who had the book obviously providing accent to important passages and all written on rice paper and hand bound- it's a little treasure in it's own right but what I particularly like about this prayer book is that it has holes in the pages created by some insect /worm many years ago ( I found some casings amongst the pages when I bought it). Anyway the thing that rather appeals to me, is that a prayer book should have holy pages! This is a piece of hand dyed shiboried muslin ( the lovely lightweight muslin that I used for the Travellers' Blanket) It measures 1 metre by 1 .2 metres and is for sale for $35 US inclusive of postage. This is a small piece I found yesterday when we emptied out the tent where a lot of my things had been stored to make way for the slab in the shed etc etc. Only one item was water damged thank goodness. It took quite some work to get it all into the shed. We have decided that my little car , a Nissan Micra, should be renamed the Tardus! 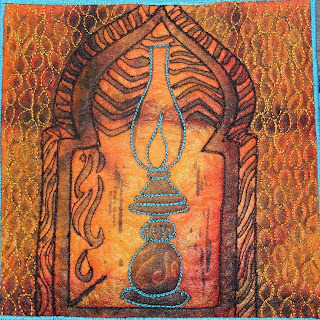 Anyway this is one of the smaller Hellfire pieces I used to make- this one is not yet quilted, I think I may do so tomorrow. And don't forget my new book is available- see the side bar for details of cost etc. Books I shipped last Friday to North America have already arrived there- which is good to know! I finished the Traveller's Medallion but must admit to suffering a bit of a crisis of confidence whilst making it and I still have not resolved what I think. The thought struck me, as I was stitching last night; that this is nothing but a flaming potholder- what am I doing here? ?Yes I enjoyed the stitching and dit did start to speak to me more as I stitched- giving some sense of the traveller who might have worn this medallion. 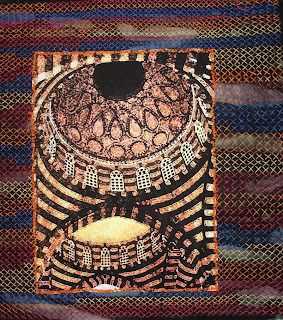 The medallion is for sale- it measures approximately 10 inches square si entirely hand stitched and is made form my own hand dyed and printed fabrics. The price is $130 US inclusive of postage. I think my crisis was exacerbated by another crisis of confidence in my personal life. Last week we had a "care" meeting regarding my middle daughter, who after our travels in Europe decided when we returned home, that she did not want to live at home- she disappeared two weekends running after we were back without telling me where, although we have a fair inkling where she was. The meeting got a bit contested because my intuition says there is something more at play than sheer wilful teenage behaviour and I actually voiced it out loud after my daughter alleged that my sanity should be examined and after it was suggested that my daughter should self determine whether the counselling she had been having should continue without reference to the gp who is prescribing anti-depressant medication (because the counselling agency involved cuts out when the child turns 16). Things progressed downhill from there and I walked out of the meeting because I was suffering such a severe anxiety attack that at one stage I thought it was something else. I walked out saying I had three children and I loved each of them. But I am tired of two years of hell that there is still this rankling in the air. I have tried , and it is wearing me down, and I have to let go. It is a strange kind of grief to let go of a living child who for whatever reason refuses to be a part of the family that I had hoped to raise- who refuses her siblings . The bureaucracy says I "favour" the other two children but in all reality all I am trying to do is keep a bit of an even keel and right now they need their mother back . All of this takes up so much space that I am finding it very diffcult to work at all- though I have to put one slow foot forward and start. I have been trying to work but progress has been impeded by various things and we had a little housewarming gathering last night. I have been working on the little travellers medallion, it's about 10 inches square .Obviously there is still quite some stitching to go. I am working on creating small traveller pieces- which I shall call traveller medallions. It was once a practice for travellers in a group on carvanas to wear a medallion to identify to which group they belonged. Caravans were often big for purposes of safety and protection , so the medallions helped not only identify groups but also fellow travellers. And I have decided I am going to have "Wongas" once a month- these will be art and textile days and anybody will be welcome to come and visit at my house ( My house is much bigger these days with more space). The idea is to enthuse and inspire each other. If you want to attend just email me and let me know beforehand.It was once upon a time more common for artists to work and sometimes live together to inspire each other with ideas and methods of working- that is of course not entirely possible here, but I would like to foster this kind of collaboration and inspiration. There will be a small cost ( $5 to cover tea/coffee and a light lunch) and the idea will be to foster creativity. My first one will be Sunday week on 14 December- I know this is close to Christmas, but hey if I don't start it will never happen! The Otways is a lovely region and the house where I live has it's own unique little environment which is sure to offer some inspiration- each day still brings pleasant surprises. Don't forget I now have my Seventy Two More Ways book available for sale- see my previous blogpsot for prices. I thought I would show you a page preview of a page in my new book. And yes I know Xanthereas is spelled with an X and not a Z- I am hoping I opened an older saved version before we did the final edits- otherwise the word is pronounced as if it has a Z. Our postage costs seem to be ever increasing - there has been two rises since the beginning of 2007 particularly for print/parcel post overseas. The prices do include airmail shipping which is the fastest method apart from courier of getting the book to you and takes between 7-10 days. It is done! Hoorah. The book is at the printer and the books will be ready on Wednesday morning. My daughter helped with the layout so it looks fine apart from the fact that some of my squares weren't perfectly square! We also added directional drawings to give you some idea of how to start each motif. I liked the way the directional drawings looked for the french version of the first book- it balanced the page more nicely.Books can be ordered directly from me. Anyway it's a relief to have it done and to be working again. I have bought an old ddesk which will hopefully solve my sewing table problem, as the table I worked on for this one was just not big enough and caused me to break a lot of needles because of the drag of the quilt. Tomorrow I hope to show you some colour- maybe even somethign dyed! I need to paint some silk to prepare for a commission piece.